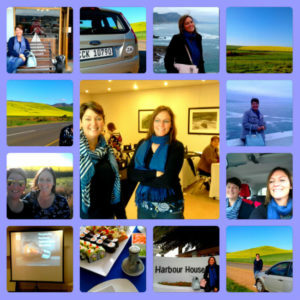 Vera Gildenhuys and I, Carol de Bruin attended a Revenue Optimisation Workshop in Hermanus on the 21st of August 2018 with Revenue Resolutions, Theresa Prins and her team. Driving from Swellendam to Hermanus the best route is definitely through Stanford! What a wonderful little place. We stopped at the Ou Meul Bakkery early in the morning for a coffee. The weather was cold and misty however, the service we received was warm and welcoming! Then on to Hermanus, once parked, we strolled to the seafront, peered over the bay, and there rolling in the deep, at least six whales, some dolphin and the odd seal popping up curiously. Our workshop started at 9am and it was extremely informative and an eye opener. We found Theresa’s Presentation, Guest Speakers and Team a wonderful combination of useful, clever and usable information, they made it fun and interesting. We joined the networking lunch after and then headed back to Swellendam. The canola in this area is in full bloom and it’s a beautiful sight, bright butter yellow for miles, we could not help stop to take a few pictures. Do yourself a favour and make time for a drive to Hermanus and back, it’s well worth the trip.